Candy Making Equipment, Candy Baking Equipment and Confectionery Supplies by Savage Bros. This mobile LifTILTruk is designed to lift, transport and pour heavy spiral mixer bowls with integrated trollies. 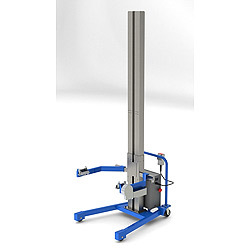 Its unique double vertical column will safely handle up to 1000lb / 450kg weights. Bowl rolls into special "nest" which secures bowl for lifting and pouring. Opeator held pendant station to control.